The big Apple (NASDAQ:AAPL) news this week comes from a Financial Times report which, citing sources familiar with the matter, said that Apple plans to spend $500 million-plus on its new video game subscription service, Apple Arcade. On the surface, that seems like a big number, and there has since been a series of articles on the internet which imply that Apple Arcade could actually be the breadwinner in Apple’s new suite of subscription services. Why the disconnect between the positive news reports and the sluggish stock price reaction? Because Apple Arcade, on its own, won’t really move the needle for Apple stock. This is a company that projects to do over $250 billion in revenue this year. At best, I think Arcade projects as a $12 billion revenue business by 2025. Thus, it’s really just a drop in the ocean. But, in combination with TV+, News+, Music and App Store, Apple is staring at a $50 billion-plus revenue opportunity in Services over the next several years. Now, that’s a needle-mover. As such, while Apple Arcade isn’t the big catalyst that will ultimately push Apple stock higher in the long run, it is one part of a much bigger Services catalyst that will do just that. Consequently, sticking with Apple stock for the long run — so long as the company continues to build out its suite of subscription software businesses — remains the right move. In a best case scenario, then, Apple converts roughly one-third of its install base into Arcade subscribers. But, realistically speaking, that won’t happen. The mobile gaming category measured just over $70 billion in revenues in 2018. On a 1.05 billion paid user base, that implies right around $5.60 in mobile gamer spend per month. But Apple Arcade is projected to launch at a $10-plus per month price point. That’s high enough to chase away some of the small fish in this market. It also hurts that there are a lot of small fish in this market, and that a majority of mobile video game spend is driven by a few huge whales. Realistically, then, Apple converts roughly 10% of its install base at scale to Arcade subscriptions. Assuming the install base hits 1 billion by 2025 and further assuming a $10 price point for Arcade, that would imply $12 billion in annual revenue. That’s big on its own. But, next to Apple’s $250 billion-plus revenue base, it’s just a drop in the ocean. Apple doesn’t need Arcade to be huge in order for Apple stock to head higher in the long run. Instead, it just needs all of its subscription services to be minor success, because the sum of a bunch of minor successes is a huge success. The strategy is simple. Apple has a 900 million and growing iPhone install base. It’ll hit 1 billion soon. The company is now rolling out various subscription services to that huge base. Those subscription services will have low convert rates, maybe around 5% to 10%. But, a 5% to 10% convert rate on a near billion user base implies 50 million to 100 million subs for a single service. At $10 monthly price points, that equals $6 billion to $12 billion in annual revenue, or $9 billion at the midpoint. That’s a big needle-mover for Apple stock. As such, so long as Apple continues to build out its suite of subscription services, Apple stock will remain on a winning trajectory. Apple stock is a long-term winner that may run into some valuation friction at $200. But, so long as Apple continues to launch new and innovative software subscription services, near term valuation friction is just noise. 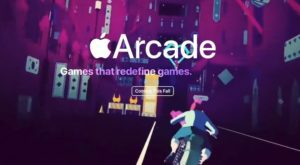 Article printed from InvestorPlace Media, https://investorplace.com/2019/04/apple-arcade-save-day-help-apple-stock/.